In Chicago, musicians have gone on strike. The players at the Chicago Symphony Orchestra, one of the country's top orchestras, let their contract expire on Sunday. And performances this week could be canceled if they fail to reach a contract. Here's Carrie Shepherd from member station WBEZ. 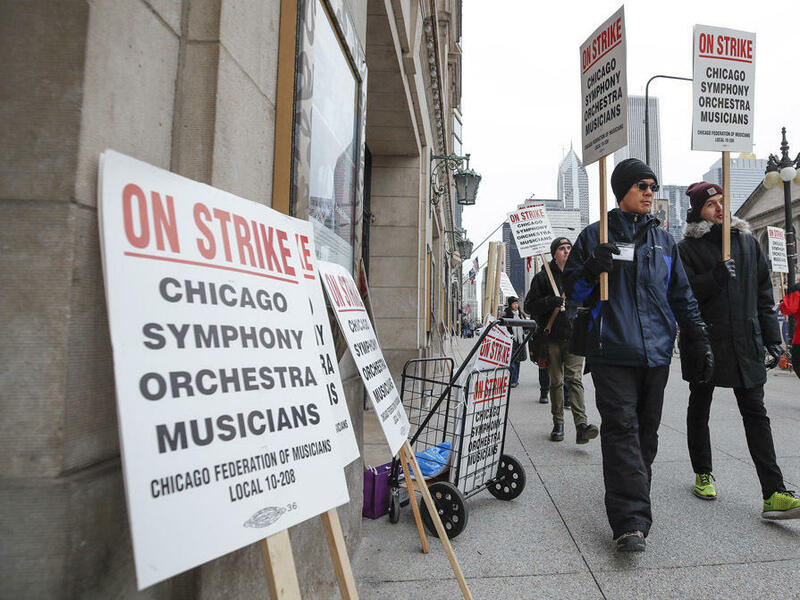 CARRIE SHEPHERD, BYLINE: Walking down Michigan Avenue in downtown Chicago, Patti Loach from Toronto stopped to talk to musicians on the picket line. PATTI LOACH: As soon as I saw their signs, I thought, oh, I've been through this before because I have a number of friends who are musicians in the Toronto Symphony. And we were on strike. SHEPHERD: Steve Lester was holding an on-strike sign and says a main point of contention is the future of the musicians' retirement plan. STEVE LESTER: Individuals would have a retirement account, which the association would fund. But the value of that account would not be defined. It would not be guaranteed. SHEPHERD: Right now it is guaranteed by the Chicago Symphony Orchestra Association, the nonprofit that manages the orchestra and its programs. Jeff Alexander is its president and says the association's proposed plan does not necessarily mean a reduced retirement fund. JEFF ALEXANDER: The offer that we've made, according to quite conservative calculations on growth of those funds, would put the musicians in as good or if not a better state upon their retirements. SHEPHERD: But the lack of a guaranteed retirement plan would hurt the orchestra's world-class reputation, according to Steve Lester. LESTER: We can't retain and attract talented musicians if our benefits continue to fall. And that also includes salary. Salary is falling relative to our other major orchestras. SHEPHERD: But Chicago Symphony Orchestra Association President Alexander counters that the minimum salaries they offer are competitive. ALEXANDER: The minimum annual salary for a member of the orchestra is just over $159,000. In our proposal, that figure would increase over a three-year period. SHEPHERD: Currently, none of this week's concerts are canceled. And the two sides are set to meet on Friday. For NPR News, I'm Carrie Shepherd. Transcript provided by NPR, Copyright NPR.